What is the first Baseball Card or Set you Remember? The first cards I remember seeing and collecting ( at age 6) are from the 1957 Topps Set. After that I remember my brother having a few 1954-56 Topps lying around the house. 1960 Topps , I was 9 years old . The first I remember actually collecting was 1978 Topps. Still have the set. 1970 Topps, at age 4 1/2. I completed the set at the end of high school. Contact me if you have any Dave Kingman cards / memorabilia for sale. 1953 Topps and 1951 Berk Ross, boxes of which were still being sold at the Abilene, TX Woolworths in 1953. Wish I'd bought more but a five cent weekly allowance only stretched so far. 1978 Topps. The Reggie (#200) is still one of my favorites. The first cards I collected were 1952 Bowmans, and my favorite player was PeeWee Reese. The following year, when I was 10, I switched from Bowman to Topps. I liked the pictures of the players very much, and I used a pair of scissors to cut out their silhouettes, whch I then taped to the wall. I still have them, although they are no longer on the wall. Nice job of cutting for a 10-year-old! Did you grow you grow up to be a tailor? And how did Rube Walker crack that lineup of superstars on your bedroom wall? - while I have to say contemplating the devaluation is painfull - they do look really cool that way! Last edited by hcv123; 04-09-2019 at 10:36 PM. Rube Walker was a Dodger, and I thought that all Dodgers were great. I also liked Mantle, because he had put on a clinic, along with Hank Bauer and Billy Martin, for the players in my Little League during the previous year, which was 1952. They were absolutely great with us, and I always liked them, even though they beat the Dodgers in the World Series many times. 1971, though I don't remember them until the mid 70's when my next door neighbor found a stack of them in his barn and divided them up three ways between me, him and another buddy. I ended up with Mays, though all of them were already well worn. The first cards I remember buying new were 1977 Topps baseball. I'm pretty sure something from the 1960 Topps Set. First cards I really remember were a 1961 Musial, a 1952 Topps Willie Mays and 52 Monte Irvin given to me by a kid so racist he did not want any black players in his collection. Looking back he deserved the hit he took on his collection. I vaguely remember having a few high number 1961 Topps, specifically Ken Boyer and Charlie James. I also cut out one more card, which was Clem Labine, who was a relief pitcher for the Dodgers. I never quite understood the criteria that Topps used to select the players to be included in that set. 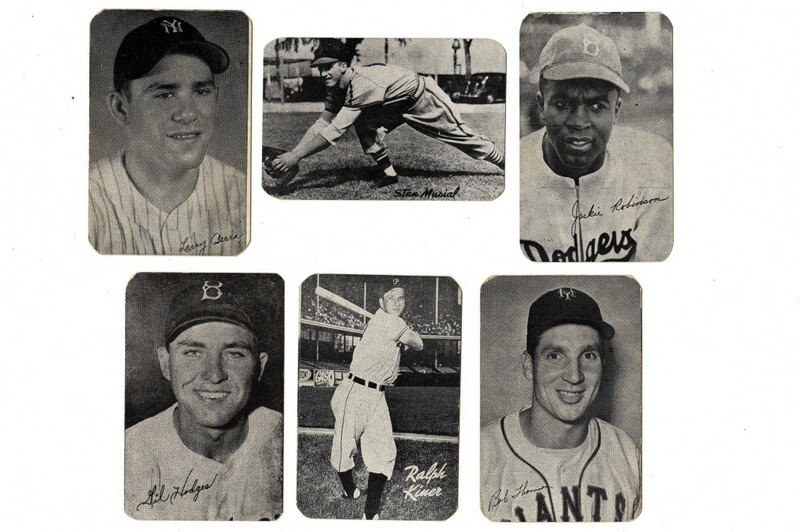 They included a lot of very minor or marginal players from each team, such as George Shuba and Rube Walker from the Dodgers, but left out some big stars, including Gil Hodges, Duke Snider, Carl Furillo, Don Newcombe and Carl Erskine. They also had ten or so numbers that were never issued. It probably had something to do with the competition that was going on between Topps and Bowman at that time. My older brother had some 1973 & 1974 Topps baseball. Also the cards from the 1969 Milton Bradley Baseball game. The first cards I collected were late 70s Hostess & Kellogs. My first actual cards I started buying packs of were 1981 Topps Football & 1982 Topps Baseball. 1958 Topps cards, owned by a girl down the street in Jericho, Long Island. I was seven. I can't remember what she looked like but I darn sure remember what an impression those cards made on me. I started collecting my own in '59. George: Those cut-out cards are really cool. Glad you kept 'em. I'm tempted to take a scissors to my '53 Topps set now. I was kid in the 'fifties so saw some of those ballplayers at Yankee Stadium. I have a clear memory of my first exposure to baseball cards. I was given a handful, maybe 5 or 6 cards, a mix of '54s and '55s. 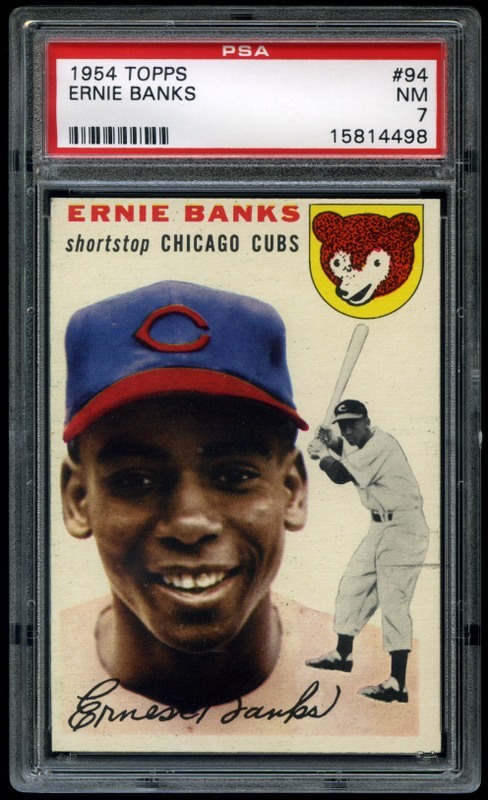 Distinctly remember a '54 Topps Ernie Banks - I was mesmerized on the spot. By 1957 I was hooked. All the cards, the Superboy comics and my coonskin cap are presently residing in the Pleistocene layer. I bought this card as a tribute to a boyhood icon. I remember clearly buying 2 Topps hanging Rack Packs with three packets of cards in cellophane (sp?) .... I hand picked them to get the ones with Koufax showing on one and Mantle and Maris on the other! Man if only I hadnt cracked em open...............got em at the Super Giant in the White Oak, Maryland shopping center during our weekly trip to the grocery store as a family. 1979 Burger King Yanks. Remember going each Sat with my grandfather and picking up a few of those packs. Favorite MLB quote. " I knew we could find a place to hide you". Lee Smith talking about my catching abilities at Cubs Fantasy camp. The first baseball card I ever saw was a 1986 Big League Chew Babe Ruth that someone had left in a library book. My first pack was 1986 Donruss, probably just a couple of weeks later. I inherited my older brother’s cards very early. He had lots of 1969-1976’s so those are where my consciousness started. I was born in the early 70’s so 1979 and 1980 is about where I recall actually getting cards from stores. In terms of really ripping tons of product I was squarely in the mid 80’s junk wax era. My dad had a friend/co-worker whose daughter worked at Topps in NYC. She was so cool and would bring me home free boxes of mid-80’s wax every once and a while. Carrying heavy wax on the train all the way to CT, how insanely amazing she was! To a young kid it was like heaven getting free boxes of cards! The first cards I ever got were from a 1986 Topps rack pack when I was eight. 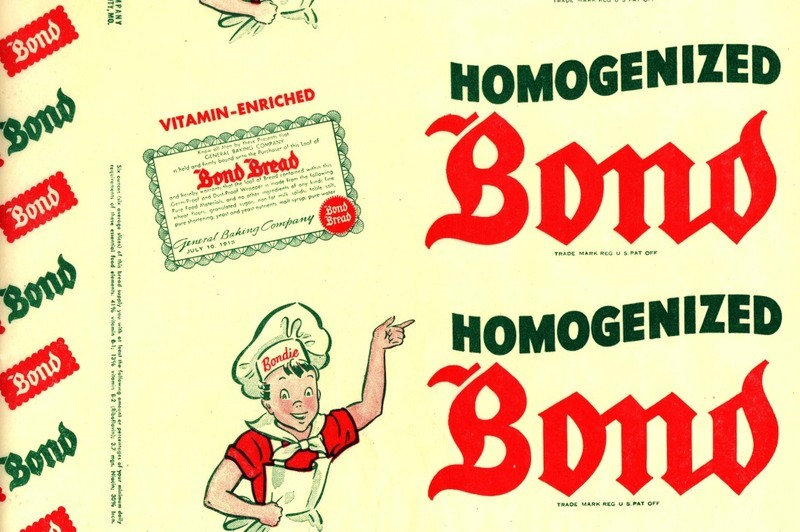 BOND BREAD packages. And, my neighborhood buddies and I traded cards till most of us were certain we had completed this 48-card set. Here are 6 of my original cards. I was very fortunate that my folks saved my Sportscards and my Lionel trains while I was away in the Air Force. You can never go wrong with a Lyle Lovett reference. 1968 Topps 1st Series from Rack Packs were my first cards, bought at the Woolworth's store. Imagine my surprise when I later found 3rd Series wax packs at a grocery store. I thought the only way you could buy cards was via Rack Packs up to that point! 89 donruss and upper deck. Although at 2 or 3 bucks a pack the upper deck were very expensive for a young kid. I never did pull a Griffey out of one. 1978 was the year I bought the whole set pack by pack at the Stop n Go. I had 1972's and up and those were my good cards. 1971 Topps. I was 9 years old and remember seeing a cello box pack with a Reggie Jackson peeking out on the front. I was a Giants fan but loved the green and gold on the A's. That was my first pack I opened. Still one of my favorite cards of all time along with the fearsome looking Willie McCovey from the same set. 1978 Topps, in packs and the large vinyl sports cases (like 1 1/2 feet high and sports characters on the outside) that came with about 20 loose cards inside one of the slots (does anyone else remember those? Football and baseball?). The oldest cards I remember seeing as a kid is the 1955 Bowmans. I remember it because I thought it was the neatest thing, little color tv's, a real novelty back then!!! I got very into collecting Wacky Packages when they came out in 1973, when I was seven years old. I was not yet a baseball fan, but I was aware of 1974 Topps baseball cards, which my friend Mark Alexander got a complete set of for his birthday. I became a baseball fan in 1975 and collected the MVP subset from that year’s Topps set, because I liked the old cards pictured on them, and I was becoming obsessed with baseball history. In 1976 I began collecting in earnest, including older cards, and in 1977 I collected the full Topps set for the first time. I definitely had the baseball one. I used one slot for each team. Loved those cases. I know I collected in 72 as evidenced by having most of the set from my childhood, but my first memory is of grouping the 73's by teams, laying a team out on the shag carpet in our living room in their positions on the diamond, propping the world book encyclopedia's up to form the outfield fence, Putting their Opponents in batting order, each batter's cards like a ramp off the floor and flicking a small wad of paper out onto the field, playing an imaginary game between teams. Of course the Reds always won and Joe Morgan's card was the most ragged after a "season"
1972 Topps - We lived in Hawaii. I never completed the set. I still have the cards. All of the cards are from the first and second series. As a military kid, we played baseball, football and basketball. We just kept playing the next sport on the calendar. I don't know if my mind had shifted to playing football or the third, fourth and fifth series never made to the islands. While in college, after I was slightly over-served at a bar, I ended up at a 7-11 type of establishment. As I approached the counter with my armload of goodies, there sat in all its glory was a box of 1981 Topps. I said right there "I never finished the 1972 set but I am going to complete the 1981 set." I completed the set and kept going, although the card producing insanity of the late 80's, early 90's drove me away from completing sets. Last edited by biohazard; 04-12-2019 at 08:30 PM. The first cards I ever owned were a bunch of 1970 topps cards...I had maybe 40 and they were rubber banded by team and at a bbcard gathering at the library some girl had a 76' topps babe ruth card and I offered my whole collection of 1970 topps' for it...she said NO!!!!!! I don't know where I got those cards from? 1977 topps was the first set I completed and that I remember buying packs of. We had a small corner grocery store 4 blocks from our house, when ever I had a dime, it was off to the store!!! I knew ever store in town that sold sports cards in case my store ran out when I had enough money to buy a pack. My month went to high school with Jerry Koosman so he was always on the top of our hope to get list. Very fond memories of my childhood. first cards that I collected: Post cereal cards from 1962. I couldn't yet read, but I loved me those cards! I admit that the cuts on the cards are not always very clean, but I still like having them. First packs that I remember seeing and that were bought for me were some Cello packs in the winter of 63-64. Still got them all, too. 1990 Topps-Walt Weiss of the Oakland As was my first baseball card. Friend gave it to me on the bus. Immediately after that, I went to the Piggly Wiggly and bought an arm full of 1990 Upper Deck, Topps, Donruss and Score sets. It was all over then.